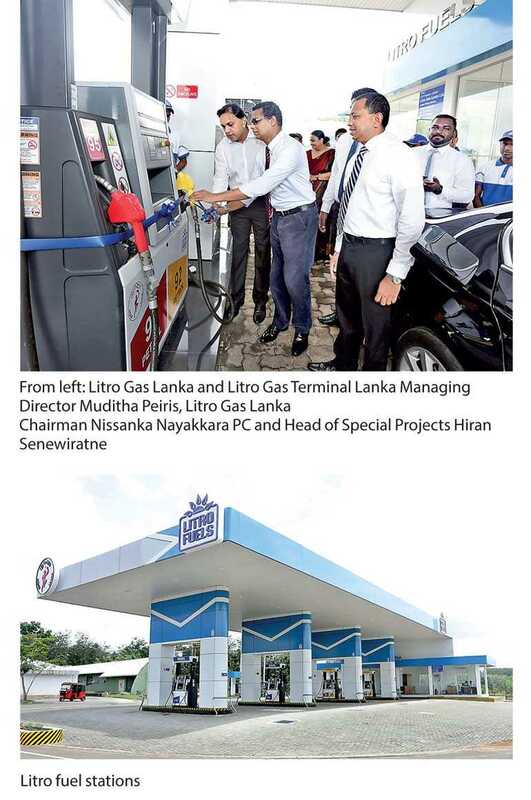 Introducing a state-of-the-art fuel dispensing system to busy motorists using the Southern Expressway, Litro Fuels, a brand of Litro Gas Lanka commissioned its first ever fuel stations on either sides of the Welipanna entrance recently. The two fuel stations which incidentally become the first ever fuel stations along the Southern Expressway comprise fuel dispensers that utilise an automated multi-product fuel delivery system with electronic receipt generation to ensure a reliable service to customers. The two fuel stations are positioned with adequate space and specifications conforming to international standards. The fuel dispensers will dispense all four varieties of Ceylon Petroleum Corporation fuel namely – Lanka Petrol 92, 95 Octane, Lanka Auto Diesel and Super Diesel. In addition, the fuel stations are equipped to provide facilities such as tyre top-ups (free of charge) and Nitrogen tyre filling service which particular service is capacitated to fill all four tyres simultaneously. “Motorists using the Southern Expressway have long felt the need for an accessible fuel station. Having realised this urgent requirement, we took measures to commission two fuel stations on either side of the Welipanna entrance to ensure accessibility and convenience. Moreover, our fuel delivery system is one of the most advanced automated features available in Sri Lanka. The real-time monitoring and electronic receipt systems embedded into this system guarantees service excellence that is on par with international standards. We as a truly Sri Lankan Company are pleased to be part of the country’s path to progress that incorporates cutting edge technology,” commented Litro Gas Lanka Ltd. and Litro Gas Terminal Lanka Ltd. Managing Director Muditha Peiris. The Southern Expressway, Sri Lanka’s first E-class highway was declared open in November 2011 and it was extended up to Matara in 2014 covering over a stretch of 130 kilometres. However, thus far the expressway continued to operate without a functioning fuel station along its length and breadth. With the commissioning of the two fuel stations, Litro Fuels offers a much needed service to motorists further enhancing their service quality by virtue of bringing in world class technology and service delivery. Litro Fuels plans to commission similar systems at convenient locations across the island in future.